It was Sunday, November 9, 2003. 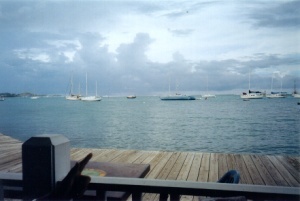 Our plan was to take a side trip from our villa on St. John to St. Croix, to visit J. We left in time to catch the 7:15 am ferry from Cruz Bay to Charlotte Amalie. We drove from our villa to our special parking space, which is about 3 blocks from the ferry dock. It was raining a bit, but the walk was not unpleasant. The ferry ticket window opened about 15 minutes before departure, and as I usually do, I waited until the line dwindled to just a few, before getting up to get our tickets. After the trip along the picturesque shore of St. Thomas, we arrived on time, at 8am in Charlott Amalie, where it was not raining. Our seaplane reservations were for 10am, so we went across the street from where the CruzBay/Charlotte Amalie ferry docks, and had breakfast at Bumpa's. This is one of our favorites on St. Thomas. It's a friendly place, located on the second floor, with an open air eating area that overlooks the waterfront. They are open for breakfast and lunch, with fast service, and we usually get to talk to the owner. It's also great for a snack or cool drink after shopping. After breakfast it was a casual walk of about 1/2 mile to the seaplane terminal. While the flight is just a short hop of 19 minutes, we were fairly tightly packed in the plane. Last year we took the Fast Ferry between St. Thomas and St. Croix. This takes about 2 hours, but more than makes up for the longer trip with comfort and lower cost. Unfortunately, this ferry runs mostly in high season, and we were a bit early for this. J. picked us up at the terminal on St. Croix, in Christiansted, and we went to a great brunch, complete with live jazz, at the Blue Moon in Frederiksted. J. must be a regular there, because everyone seemed to know her, and we were seated at a very nice table location. After a sumptuous brunch and a lot of conversational catch up, J. took us to the St. George Village Botanical Garden. What a beautiful place. We spent about 2 hours there, thoroughly enjoying the landscape from desert to rain forest, and the plantation ruins. I'm sure we'll go back again during a future visit..
We went back to La Alegria (J&B's house) to freshen up and have some more quality time before going to dinner at the South Shore Café where we all enjoyed our meal and the company. On Monday, after a casual breakfast, we went into Christiansted to do some shopping. The shops here are a bit more numerous and sophisticated than in Cruz Bay, without the chaos that is the norm in Charlotte Amalie when the cruise ships are in (which is most of the time). We ended our visit to Christiansted with lunch at the Fort Christian Brew Pub, a friendly place with a good view of the harbor, and the makers of Blackbeard Ale. It was a short walk to the Seaborne Air terminal, followed by a 19 minute flight back to St. Thomas. When we arrived, we could see a cloud cover coming in, and the pilot said it would start raining in about 5 minutes. We retrieved our belongings and got right into our 1/2 mile walk to catch the 4pm ferry to Cruz Bay. With what we thought was time to spare, we and 2 other couples were walking along the waterfront from seaplane terminal to ferry dock. True to the pilot's prediction, it was starting to rain very lightly, which was actually quite comfortable, since we were setting a good pace. All of a sudden L noticed that the ferry seemed to be getting ready to leave, even though it was before 4pm. She had the lightest load and ran ahead to stop the ferry from leaving without us. She succeeded and they pulled back in to let us on board. They did not see us coming, and were trying to get ahead of the rain. By the time we were out of the harbor, it was raining heavily, and a few of the passengers who had gone forward onto the open deck came back quite soaked. We arrived at Cruz Bay in the continuing rain, and with umbrellas open we walked back to the car. On the way back to our villa, we observed that the pilot had not mentioned when it would stop raining, but that's another story.